My mom recently has been working on her beautiful new deck, adding seating and flowers etc. 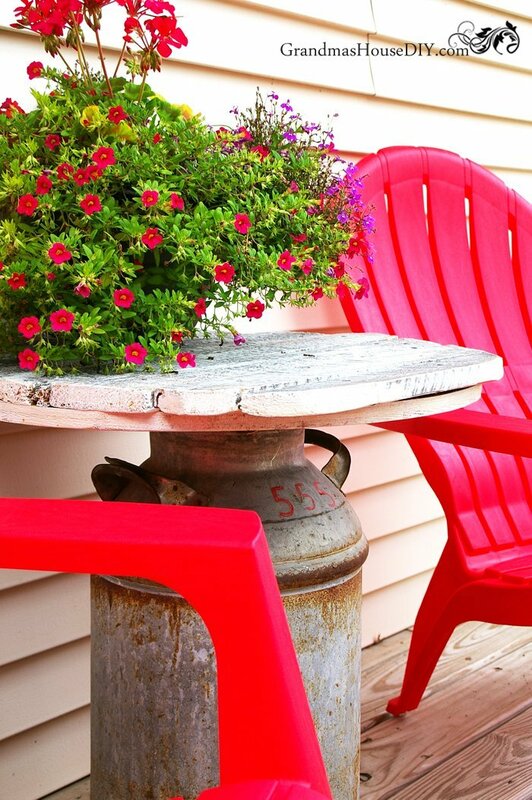 She picked up four red Adirondack chairs and then commented, “I really need just one little end table!” My brain immediately started turning and it didn’t take it long to land on this old milk can. 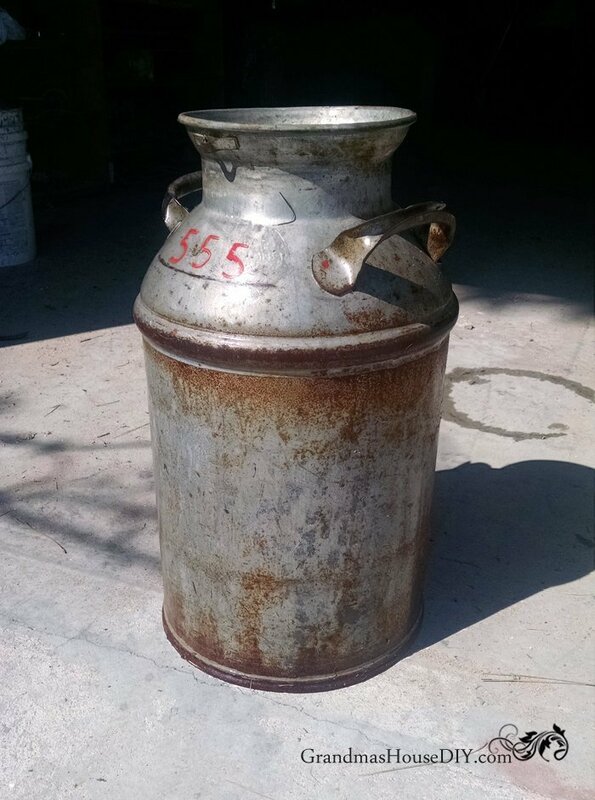 My mom had mentioned a couple of years ago that she really wanted one of the old milk cans she was sure were lying about the farm. I found one out in the woods one day but it was in such bad shape I didn’t even haul it back to the house. Fast forward another year when I went to grab a big screen I had spotted between our wood shed and our completely caved in old granary. (I used the screen to build a screen door for our “wood shed” under our staircase.) I peaked in the old granary for good measure thinking I might be able to salvage a shelf that’s still in there when I saw it: an old milk can! And it looked awesome! So I carefully went in there to grab it (trying not to fall through the floor and also trying really hard not to hit my head on any of the roof that had fallen in!) The minute I got to the milk can I realized that it was (not surprisingly) 1/4 full of some kind of liquid. I eyed it for a minute, gave it a little sniff and realized it must have been anti freeze… or something – YUCK! So, without any thought I just tipped it over and dumped it out. To this day I’m not over the horror that came out of it. Honestly, I’m not squeamish, I have never been squeamish, but I just wasn’t prepared for what gushed to my feet: At least forty very dead, and freakishly well preserved, field mice all tangled together. *shudders…. * Eeeeeeeewwwwwwww. I literally proceeded to throw the milk can in the bushes on its top (so it wouldn’t fill with rain water) and ran away from it. Fast forward over a year later and I went to fetch it, carefully sniffing and trying to decide what to do about getting it rinsed out. I dumped a good portion of mineral spirits in the can and did lots of swishing and then proceeded to hose the whole thing down in the back yard for probably much longer then it needed. Honestly I’m still shuddering, that was SO gross. 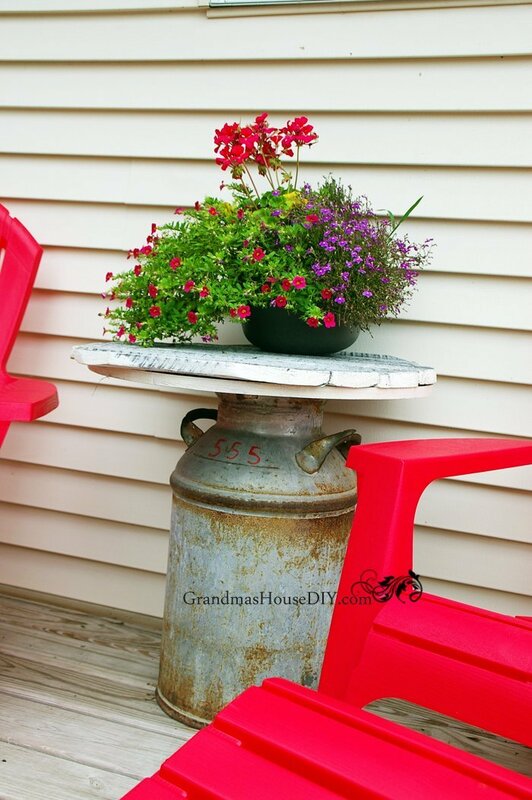 Anyway, on to creating an end table out of an old milk can. If you do a search on Pinterest I am by far NOT the first person to do this! I grabbed some leftover plywood for my base and drew a circle to the size I wanted the top to be using a pen and a piece of string. Then I cut that out with my jigsaw. 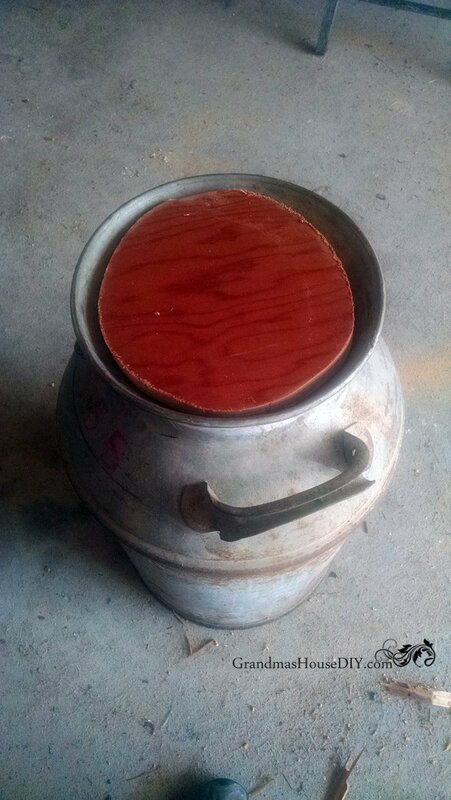 Next step was to cut a much smaller circle that would sit inside the opening of the milk can to help hold the table top in place. I just screwed them together, putting the smaller circle in the center of the larger circle. 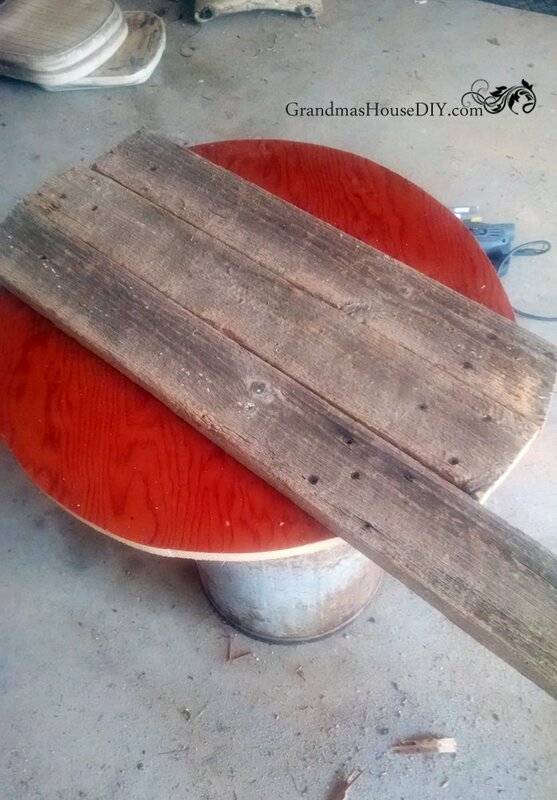 My mom has always wanted some barn wood from my grandparents’ (her parents) old barn so I thought this would be a perfect project for barn wood. 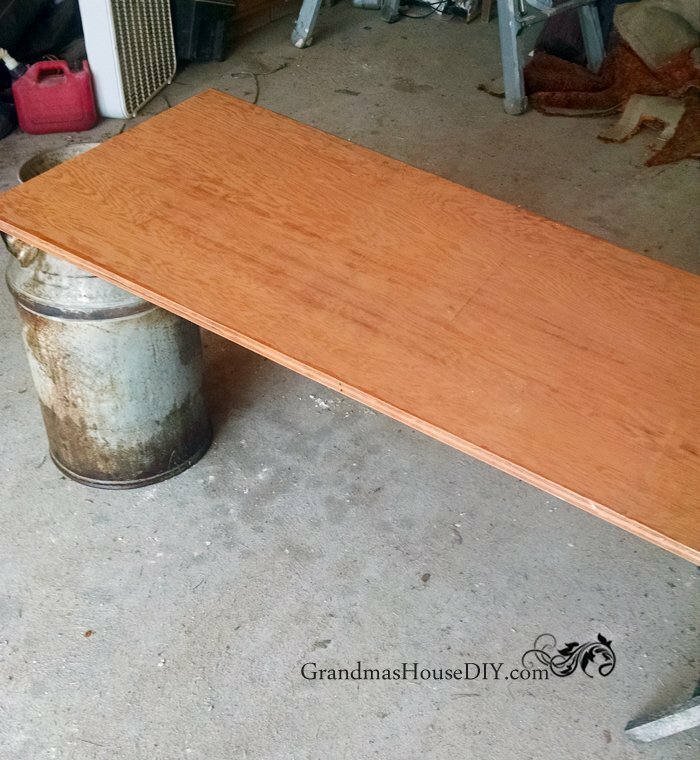 I laid a piece down in the center and screwed it to the table top then cut it off and just kept going until the top was covered. Then I took my jigsaw and cut the barn wood off in a circle around the whole thing, letting it hang over like a lip a little bit. 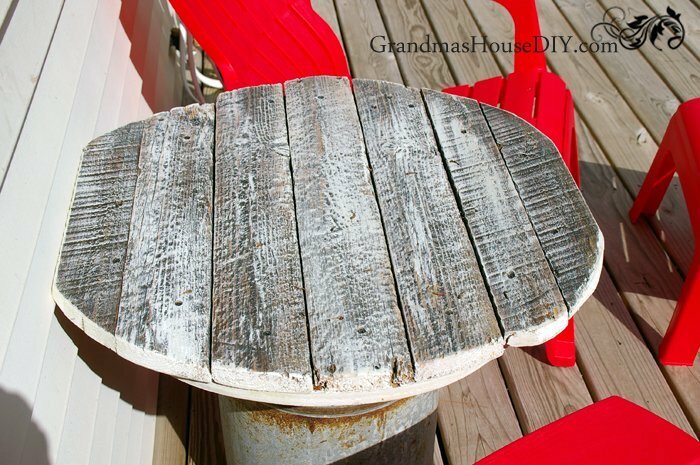 (I did all of this with the mind that it would be rustic and not at all perfect.) I lightly sanded everything (top and bottom and all of the edges) to make sure no one would get splinters. I then grabbed some white outdoor acrylic paint I had on hand and painted all of the raw edges and the edges of the plywood so there was no “new” looking wood showing. I also did just a light white dry brush over all of it so the white edges weren’t so stark. I also did a very heavy coat of outdoor polyurethane over the entire thing. So very nice….nice memories…thank you for sharing. 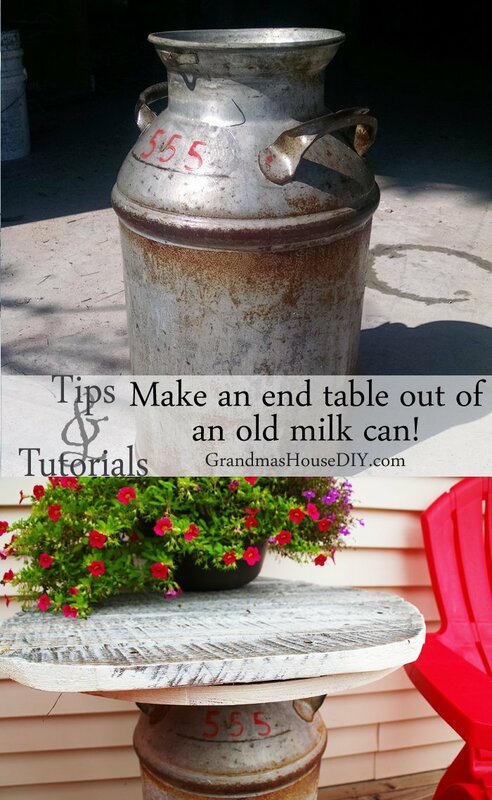 Love your milk can side table. I have a milk can in my entry way, just might have to make a side table out of it. What a lovely story and great undertaking. After all those mice, I might have left it. Great idea – and great instructions! Thanks for sharing on the Pleasures of the NW’s DIY party! This is such a fabulous project! I absolutely love your creativity! Thank you so much for sharing with us at Dishing It & Digging It. First of all, this is my first time here and I love your blog. Like, LOVE it. I am so sorry about your grandma’s but they would be so proud of you and what you are doing is so heartwarming. They need more people like you and Joe in the world. 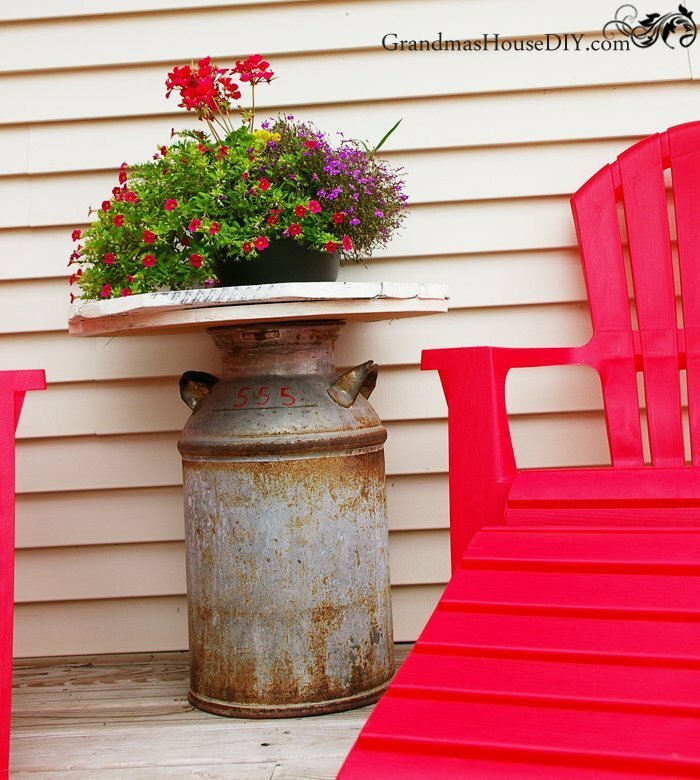 Second, I have a milk can JUST like this that I blogged about and painted over this past fall. And now I need to make it into a table. Adding you to my Bloglovin’ feed because your blog stands out from the rest. Thank you for that, by the way. Okay, so that is definitely a gross story! But I love that your mom’s new table has such memories. It’s so rustic and unique. Fantastic job! Thanks so much for linking again at the #happynowlinkup! Thanks for sharing this step-by-step process! 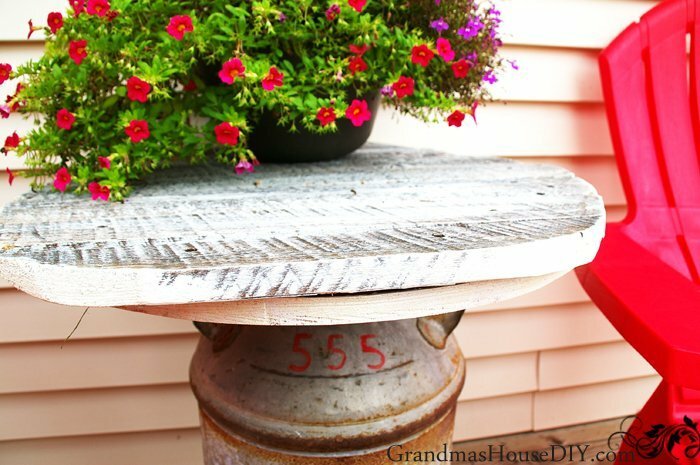 I love how your little table turned out! Thanks for sharing! This turned out so well! I have an old milk can from my grandmother in my dining room. You may have inspired me to do the same. Thanks so much for sharing at Merry Monday! Congratulations on being featured this week on Your Inspired Design. Thank you for sharing your talent. Your Inspired Design is open every Thursday so we hope to see you again. Love this idea. Now if it would get warm so I can put one up on my porch. Thanks for sharing with us at Family Joy Blog Link Up Party this week. Glad you joined us. Thanks Charlene! I feel absolutely the same way, can’t wait to lose all of this snow so we can enjoy our deck again! You are brave to have gone back to get the can after finding it that way! I don’t think I could have. The table turned out great and how special that it’s a piece of your mother’s childhood. Thanks for sharing at Snickerdoodle. Pinning to my Upcycle & Restoration Board. Great idea! 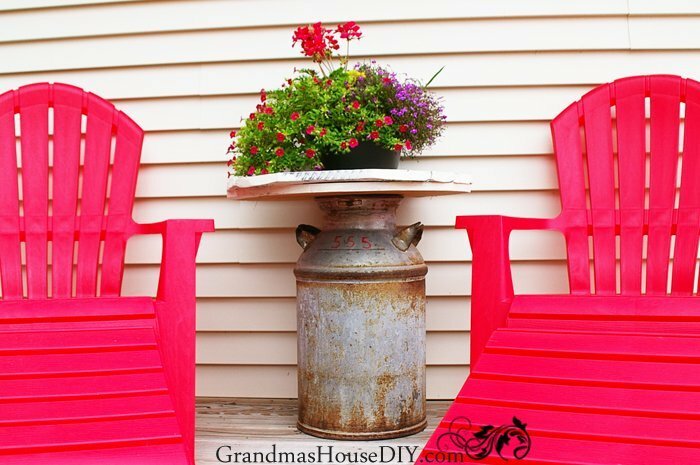 The can looks wonderful on your moms patio! The mice would have given me the heebie jeebies! Thanks Pam! I still shudder when I think of it lol! This is a totally wonderful idea! 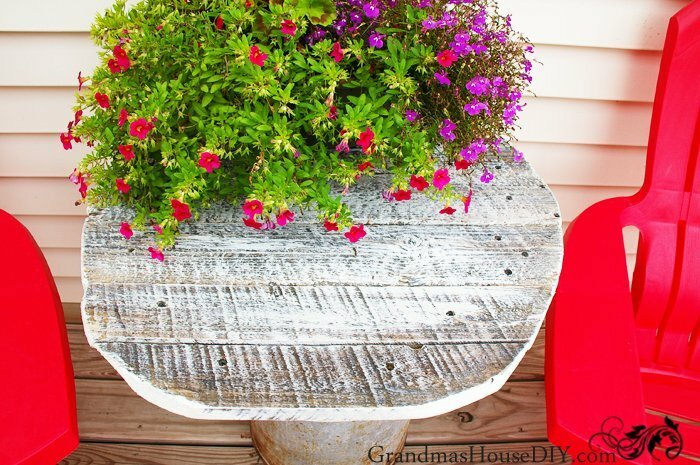 Great re-purpose and upcycle! It looks super pretty. Visiting from Creative Collection party. The milk can is very well done and so fitting for the farm setting. Your Mom must really love it. Its perfect with her gorgeous red chairs. I love this – I so wish that I could find the cans here in the mountains. The antique stores have some, but charge way too much. I hear ya! I was looking at milk can prices the last time I was at a flea market and WHOA! Fortunately we happened to have one! Thanks for the great idea! 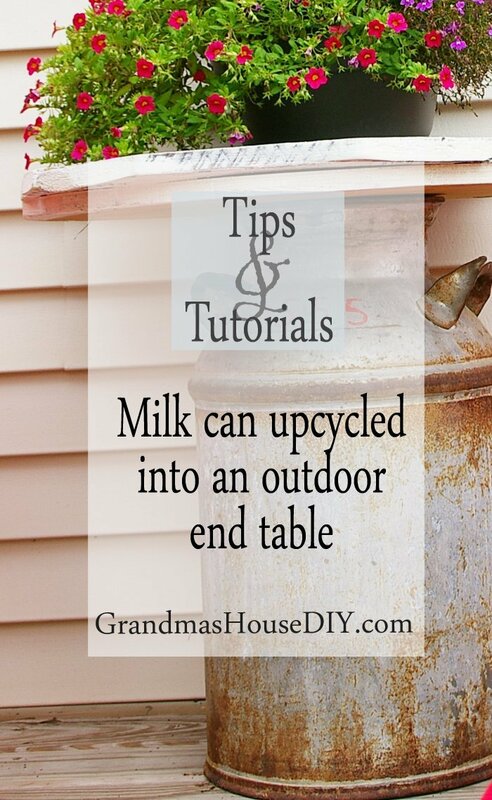 I have an old milk can, that I have never known what to do with it! Have a great Monday! Thanks for coming by Natalie! I love it, great upcycle. Thank you for joining The Really Crafty Link Party this week. Pinned.